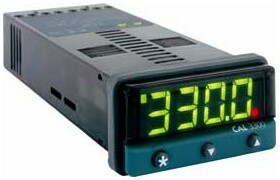 The CAL 3300 controller is designed to be easy to use, low-cost and reliable. It features CAL's auto-tune, which makes P.I.D. control simple, the controller's self-tune function can automatically selects the optimum P.I.D. values. It also has CAL's unique dAC function to minimise the overshoot problem associated with conventional P.I.D. control. It accepts nine common thermocouple types as inputs, as well as 2-wire RTDs, and has an SSR Driver and Relay output.